Home page of Curling Legs most featured artist. Homepage of the great singer and songwriter. 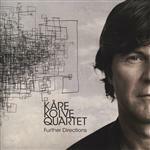 Kåre Kolve Quartet follows their debut with the beatiful "Further Directions".